I wasn’t going to get this particular duo, but it caught my eye. I was lemming for Charade for the longest time, but found that it didn’t swatch very well on my skintone and I feared it would look a little flat. So, I ended up choosing between this, Grand Palais, and Kuala Lumpur, which is somewhat similar but had two shimmery shades. Robbie, the SA, said this was a better option and you know me, I am very easy to convince. The two colors in this duo are a “silver taupe” and a “dusty rose.” The reason why I chose this over Kuala Lumpur, which I was instantly attracted to, is because of the finishes. 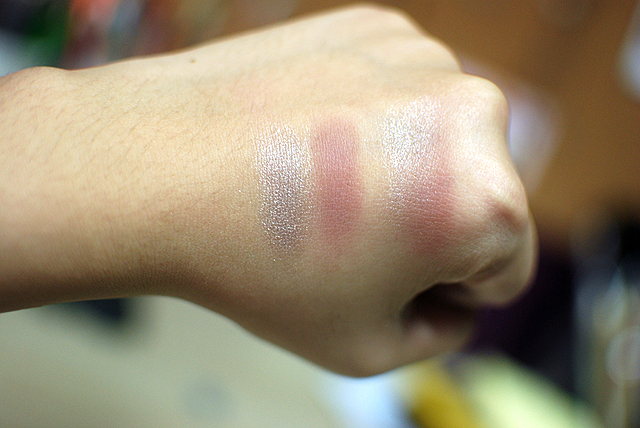 The silver taupe shade has a slight sheen to it, nothing overly shimmery, and the dusty rose shade is a full-on matte. This is pretty much a full eye look right here, which is what duos are supposed to be for, right? 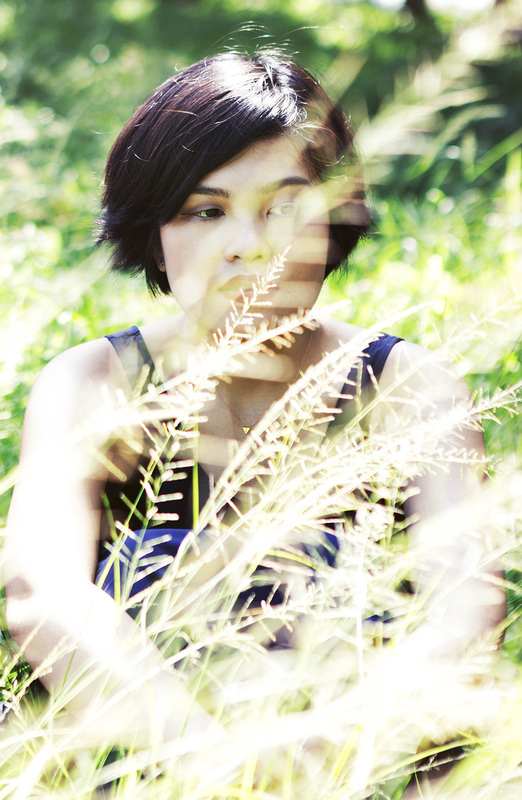 Here are two colors from the duo, as well as a swatch where I have them blended together. It creates a rather nice soft brown color with a little bit of sheen. This is the look that I came up with using this duo. Isn’t it a perfect neutral eye, with just the right amount of rosy pop on the crease? Non-brown colors aren’t typically used for a neutral eye, so that subtle rosiness works in such a pretty, lovely subtlety, in my opinion. This is also very easy to wear with a number of different combinations. You can choose to stay neutral and rosy all throughout the face, or pick a feature to highlight, like putting on a strong blush color, or painting on a bold lip. It won’t take away from the other colors or other features you want to highlight, and I don’t think that the combination is strong enough to kind of overshadow or compete with them, either. If anything, I think that this eye combination can actually accentuate most colors. 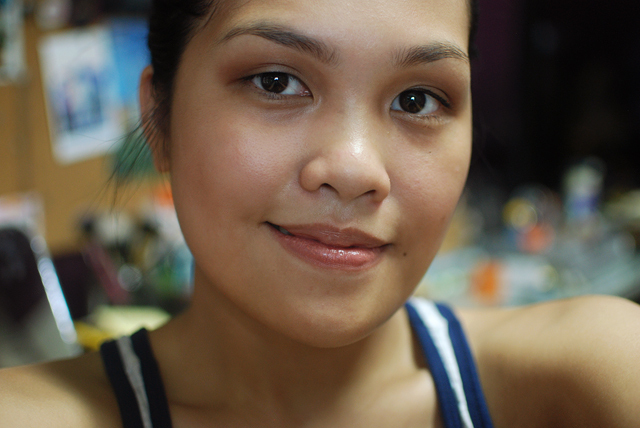 In this look, for example, I’ve really noticed that Exposed, a fairly neutral blush I have a hard time wearing, pops out. You can also create another look with this duo, using the silver taupe as a light wash of color all over the lid, with the dusty rose as a liner. You can also just do a pretty natural(ish) smokey eye by patting on the darker color on the lid (darkening near the lashline with a smudged out black shadow or liner, of course), then blending it outward/upward with the lighter color. I am in love with the gradient that these two shades make. Though NARS (usually) makes awesome eyeshadows, they sort of do need a primer to help them stay on the lids for much longer than they would without some kind of base. Since my lids are pretty oily, the shadows crease and disappear after a few hours. 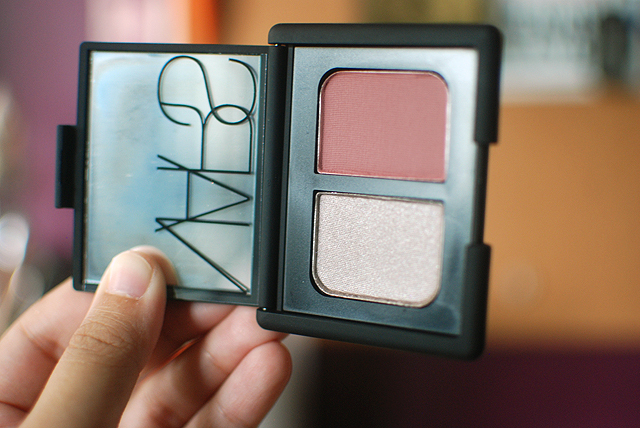 A tiny, tiny gripe I have with the NARS Philippine division (? ), though, is that they don’t teach their sales reps how to pronounce the names right. I heard “Cha-rade” instead of “Sha-rade,” and “Grand Pala-is” instead of “Grand Pa-lay.” It’s nothing really major and it probably sounds jerky, but I think brand reps should at least know what the shades are called. Anyway, I love Grand Palais, and I’m glad I picked it up! I currently have four NARS duos and a couple of other palettes, and they are usually a super hit or an underwhelming miss. Definitely read up on pigmentation and quality, or swatch them in store if you can, before buying anything. 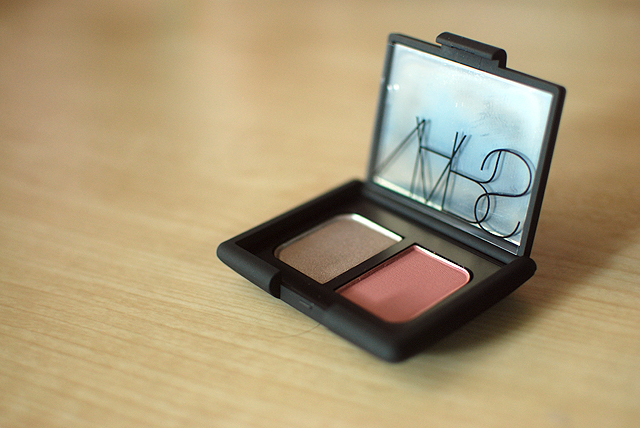 NARS is a cruelty-free company owned by Shiseido, which is a company that used to test on animals. That dusty rose is such a amazing color! YOU pull it off but I imagine this would look too red on me..
Yeah, I think I have really, really warm undertones.